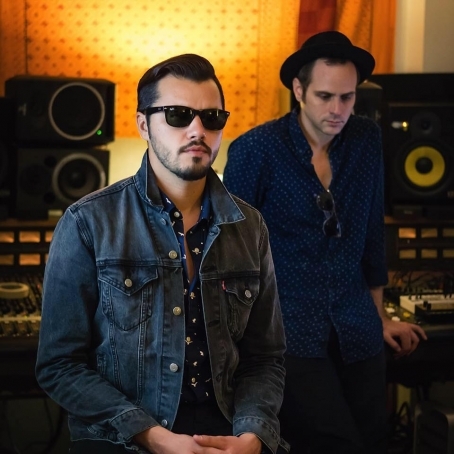 Heartbreak Bugaloo (Skeleton Farm Records) marks the first collaboration of two talented artists: Aaron Behrens (Ghostland Observatory) a vocalist, and the guitarist, Jonas Wilson (Lomita, The White White Lights). Together the duo is known as The Midnight Stroll, previously 'Aaron Behren and The Midnight Stroll,' and these two artists- who have previously worked in everything from EDM to glam to bluesy indie to pop- have come out with one excellent creation of contemporary rock n’ roll this time around. The emotional eight track album is perfectly summed up by the final track, 'Sparkle and Fade': here the rock duo adds in a piano bit with stripped vocals that eventually raise into a cathedral-filling, crescendic feel, at last expressing all that sadness you’ll have accumulated by the end of Heartbreak. It’s quality rock music from two of Austin’s most respected, and enough to earn them Artist of the Month for June here at The Deli Austin, so listen below to ride through this emotional roller-coaster.